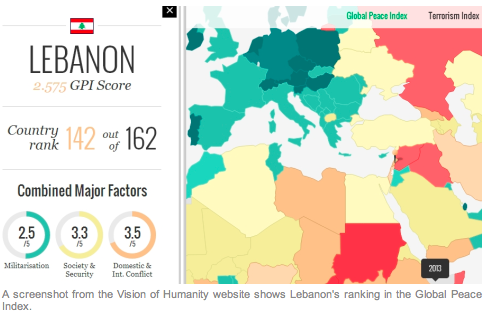 While Hassan Nassrallah tries to “liberated” Syria, his own country ranks near the bottom of the global peace index. Then again, the word “peace” is not in his dictionary. This entry was posted in Home, Reflections and tagged Hassan Nassrallah, Lebanese, Lebanon, Peace, Vision of Humanity. Bookmark the permalink.